The UN Climate Change Conference brought some 40,000 delegates, observers and journalists to a city still shaken after the horrific November attacks that took the lives of 130 people and injured many more. A Russian reporter attended the conference long’s sessions and tried to read between the lines of the draft texts. Can ice cream be political? It can, if it’s the right kind of ice cream. That’s what delegates at the 2015 United Nations Climate Change Conference in Paris learned on Monday, Dec. 7, as they were offered a free scoop of ‘Save Our Swirled,’ a flavor of ice cream by a famous US brand that is, much like the Earth’s polar caps and glaciers, best kept frozen. 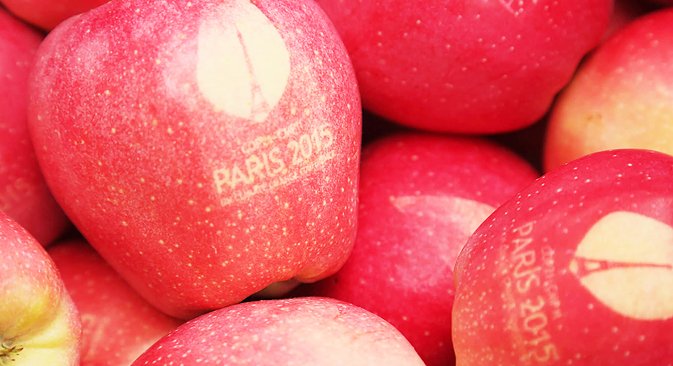 Those who preferred healthier dessert options could go for the official COP21 apples waiting inside the plenary hall. These special fruits with the conference’s leafy logo carefully ‘grown' into them come from a farm near the French town of Metz and are said to be quite expensive at around $500 a piece. These gastronomic stunts are very much in line with the UN climate change negotiations in typical French style: restaurants and bakeries spread throughout the venue make the difficult task of being in Paris and working a little easier. If you can’t leave the most important negotiations in a decade, to go sightseeing, you might as well enjoy what little breaks you have. France, which is presiding over the UN talks this year, did not stop at the refreshments. The Paris gathering is taking place at Le Bourget, a place perhaps uniquely suited for such a jumbo jet-sized affair, and the conference space is very well planned and comfortable for everyone. From recyclable plastic coffee cups — a welcome step forward from the wasteful paper ones that have plagued these events before — to charging stations where you can cycle your smartphone back to life, from gift bags made of recycled sweaters to electric rental cars, COP21 is a decidedly green affair. One can even cancel their own ‘carbon footprint’, the amount of CO2 emissions caused by travel and working at the conference, through a one-stop online shop of climate friendly projects from all over the world. The number 21 in the name of the conference, shortened to COP21 and always bringing a flurry of ‘good cop, bad cop’ jokes that never get old, is the age of this process. In 1995, countries that had signed the UN Framework Convention on Climate Change first met in Berlin to start working on a protocol to achieve the goals of this convention — that is, to prevent dangerous levels of manmade climate change. This led to the Kyoto Protocol, which bound the developed world to reduce greenhouse gas emissions and established mechanisms to help them do so. Following 190+ countries trying to agree on something can be tiring. Source: Creative commonsBut the rapidly changing world economy meant that by 2005, when the Kyoto agreement entered into force, it was already largely outdated, with half of the ten largest CO2 emitters being developing countries with no legal obligations to curb their fast growth. So parties to the convention decided to address this by extending Kyoto for a second commitment period and, at the same time, crafting a new broader and more inclusive agreement that would gradually overtake the global climate change fight. Many experts thought the Copenhagen summit was doomed to fail because the countries came unprepared, so the second attempt was all about not repeating the same mistake. Hidden under the glossy surface of fancy treats and eco friendly exhibits at Le Bourget is the tremendous amount of work done by everyone before the conference even opened its doors. The drafting group met five times just this year, and French politicians like foreign minister Laurent Fabius, climate envoy Laurence Tubiana, environment minister Ségolène Royal and even François Hollande himself met with endless government officials in an attempt to put out the fires before they broke out and find the much needed compromises. The Paris summit brought some 40,000 delegates, observers and journalists to a city still shaken after the horrific November attacks that took the lives of 130 people and injured many more. Impromptu memorials at the Bataclan theatre and Place de la République as well as occasional heavily armed guards in the streets, a rather unusual sight for a European capital, served as chilling reminders of what had happened here just two weeks before the international conference. Terror in Paris made the summit, planned several years in advance and virtually impossible to reschedule or cancel, a political statement in its own right. As U.S. President Barack Obama claimed on the first day of the talks, climate change “could define the contours of this century more dramatically than any other”, and thus gathering to discuss it in the face of heightened security concerns was an “act of defiance”. Domestically, comparing climate change to terrorism did not go well with his political opponents, who blasted Obama for callousness and praising what they see as a pointless bureaucratic gala for the select few over a grave and imminent threat. Indeed, UN climate negotiations seem alien and arcane to an outsider, and rightfully so. An ‘alphabet soup’ of acronyms and technical terms has too peculiar a taste for the general public, hence an army of journalists often struggling to write their stories without a single link to the UN online vocabulary. Simon Roger, a climate change reporter for Le Monde, observes that the Paris conference is viewed much more positively by many observers and media, as “people seem to have a better understanding of what’s happening and how this thing works.” That is an understatement; by this time, the 2009 Copenhagen summit had new drafts popping up like mushrooms after the rain and everyone struggling to follow, in a slowly brewing panic over the outcome. The French presidency has streamlined the process into something I can, thankfully, explain without using a single abbreviation: On Wednesday, Dec. 7, the president presented a ‘cleaner’ draft text with four times as few options to squabble over. That was, naturally, still too much as it took countries five hours to study the document and more than three hours to get through voicing their concerns and reservations in public. The meeting then reconvened at midnight and went on until early morning, and a new and improved draft is expected later in the day. The traditional expression of grievances with the president’s text led the lead Russian negotiator, presidential envoy Alexander Bedritsky, to wonder whether the 48 hours left until the official deadline — which, in the 21 years of talks, has never been met — allowed any time for an exchange of opinions. There was, of course, some irony in taking the time to express an opinion on the necessity of expressing opinions. One might wonder as to why exactly it takes a group of experienced professionals, some of whom have been doing their job for multiple decades, so much time to agree on a few pages of text, and why this text always seems to appear at the eleventh hour, as if this was a high school science project from a bunch of procrastinating seniors and not a recognized global challenge. One reason is the notorious issue of consensus: all decisions in the climate forum have to be made unanimously. In practice this means a small group of countries or even a single objector can block the process altogether, so any language has to be carefully crafted to be just vague enough — not too hot, not too cold — for no one to take issue with. This becomes an all too familiar exercise in coming up with previously unknown terms and concepts that are often intentionally defined quite poorly for everyone to read into them what they will — and argue over it at the next conference. Another reason for this verbal ingenuity is the sheer scale of decisions being made. Every possible option in the long-term goal section of the agreement, where countries have to define its ultimate objective (’stopping climate change’ is no longer specific enough; stopping where? and how? ), represents billion-dollar shifts in investment in energy and industrial projects. The seemingly nonexistent difference between ‘climate neutral’ or ‘zero carbon’ in the text, when trickled down from the international level to the ground, i.e. local business decisions, may translate into years and even decades of development. The UN negotiations may represent international diplomacy at its absolute worst, but the problems they aim to solve are disturbingly real. The latest reports from IPCC, an international panel of experts, as well as scientists from all over the world, highlight the impacts of global climate change already observed everywhere. From coastal erosion to droughts and extreme flooding, permafrost thawing and species being pushed out of their habitats, the reality of climate change needs no brackets. In fact, two of the signature French staple beverages, wine and coffee, are at risk. Many varieties of grapes are vulnerable to even the slightest change in the amount of sunshine, available water or temperatures, and Arabica is already under threat from both the changing climate regime, decreasing yields and pests such as the coffee borer beetle, which thrives in warmer conditions and currently steals some $500 million worth of unpicked coffee beans every year. In order to prevent the average global temperature from climbing two degrees Celsius above the pre–industrial levels of the 19th century, countries have to reduce their greenhouse gas emissions by transitioning to cleaner energy and materials as well as increasing energy efficiency and stopping deforestation. Yet, some impacts are already here, and there are no ways of preventing them save from a hypothetical time machine. So, for the first time in the negotiations, the new agreement will address adaptation by making countries invest in smarter ways of living in a new climate. At this point, observers tend to agree that the draft text, which can only be made shorter and is shielded from any major edits, will result in a small but necessary step forward. Stripped of any new meaningful targets, the agreement seems to be an unpleasant hurdle countries have to get over to proceed to less politically charged tasks. Everyone agrees more work will be needed in the coming years as the agreement is supposed to take over from Kyoto Protocol after 2020. But even the pledges decried as woefully insufficient by green activists still do steer the world away from a catastrophic scenario described in a World Bank “Turn Down the Heat” report, which imagined a ghastly world four degrees warmer than it used to be. As of now, humanity seems set to stop just 0.5 degrees short of the threshold — with one degree already locked in, according to the World Meteorological Organization. With the conference approaching overtime, it is not yet clear whether this idea gets back into the text in name only.